PURELAB Chorus 1 Complete provides a complete solution from tap to ultrapure water direct from a potable water supply and is ideal for laboratories needing up to 100 liters of 18.2 MΩ.cm ultrapure water. 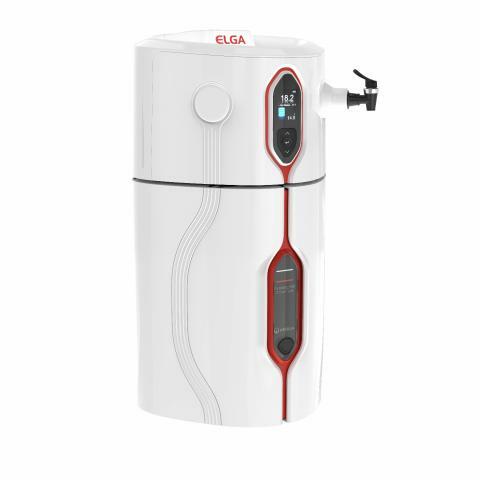 With its simple and ergonomic design and ease-of-use, water can be dispensed directly from the system or from a choice of additional Halo Dispensers. Fully Recirculating Recirculation of purified water through our modular reservoir to maintain consistent peak water purity at 18.2 MΩ.cm. 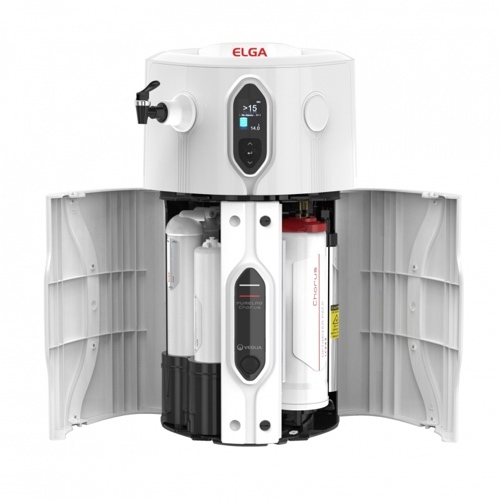 ELGA Biofilter (optional) When fitted, PURELAB Chorus 1 Complete produces water which is free from biologically active impurities. Single System Solution Perfect single system solution for analytical and life science applications requiring 18.2 MΩ.cm. Easy Access Front entry service doors provide quick and easy access to consumables. Space Saving Design Designed to be modular and stackable to save space, whether wall-mounted or under the bench. Data Capture Data capture via USB for system performance validation and software updates. Very Sleek Look with Excellent Performance! Our unique range of storage solutions is designed to maintain the optimum purity of stored water and provide effective protection against airborne contaminants. They are designed to accommodate PURELAB Chorus water purification systems by maximizing the space in a single integral, compact unit or to sit independently to suit the layout of your laboratory. Multiple positioning Multiple positioning/mounting options to suit your laboratory layout. Polyethylene construction Inert opaque polyethylene construction with a smooth inner surface. Dispense tap Positioned to minimize accidental operation or damage (choice of positions). Advanced vent filtration Prevents the ingress of airborne bacteria, particulates, organic vapors and CO2. 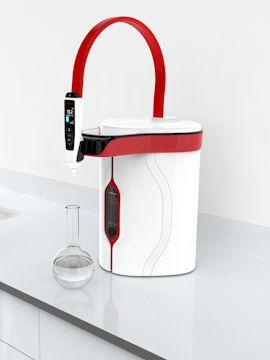 Autofill Monitoring of reservoir water levels with automated refill ensures purified water is always available. Hygienic Overflow Hygienic overflow in the unlikely event of water system malfunction. Easy display Direct display of stored purified water on the front of the reservoir for easy identification. The modular nature of PURELAB Chorus means that your dispense solutions sit independently from the unit. You can even have the Halo Dispenser installed in an adjacent laboratory. With Halo Dispenser you have the ultimate flexibility. Clear Display Prioritized information displayed at all times (system status, alarm) for absolute confidence as you dispense. Multiple Positioning Position the dispenser independent from the water purification system. Optimize your lab space. Modular nature of PURELAB Chorus means that your dispense solutions can sit independently from the unit. You can even have them installed in adjacent labs. Water is used across the lab in a plethora of different techniques and applications. 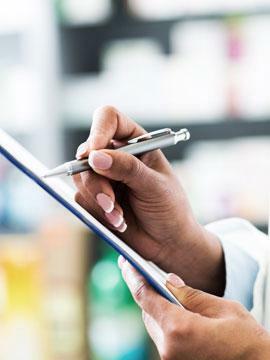 From glassware washing to autoclave filling, water is a common reagent. Microbiological analysis is the use of biological, biochemical, molecular or chemical methods for the detection, identification or enumeration of microorganisms in a material. It is often applied to disease causing and spoilage microorganisms. Chemistry has the power to explain everything we touch and see in our world. It may be considered as the main pillar of the natural science necessary for detailed study in the physical science or engineering. Atomic spectroscopy studies the absorption and emission of radiation by atoms. The technique is used to determine the total concentrations of specific elements in a sample. Gas chromatography is one of the most sensitive and commonly used analytical techniques for the separation and determination of various compounds. Immunochemistry is a branch of chemistry which focuses on the study of the immune system as well as immune responses. Spectrometry is the spectroscopic technique that is employed to assess the concentration or amount of a given substance. Every compound will absorb or transmit light over a certain range of wavelengths, and so that this can be used to measure the amount of a known chemical substance. To learn more about the benefits of PURELAB Chorus 1 Complete, contact us and we’ll put you in touch with one of our Approved Partners and Lab Water Specialists.